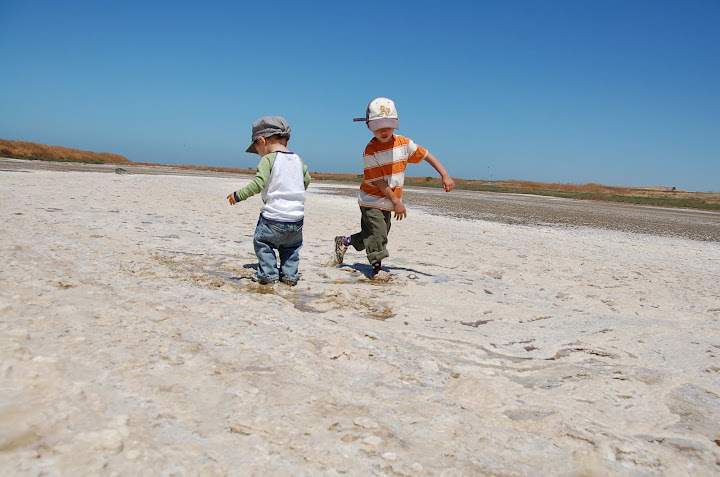 For some reason, not a lot of people come when we plan an Outside Kids trip to Coyote Hills. Maybe it is because we usually go there in July with hopes that the breeze by the Bay will be cooler than the parks inland. July isn't a good month to plan anything, I gotta say. Or maybe it's because there's not a lot of interest in Coyote Hills for some reason. Maybe without a promise of a creek to play in, you all say 'no thanks.' Maybe it's being confused with Coyote Point in San Mateo and there is a big group every time looking for our car and the hand-drawn maps on the back? I don't know what it is, but you're missing out. Coyote Hills is big and wide and expansive. But with a little bit of time in one spot, all kinds of details emerge. 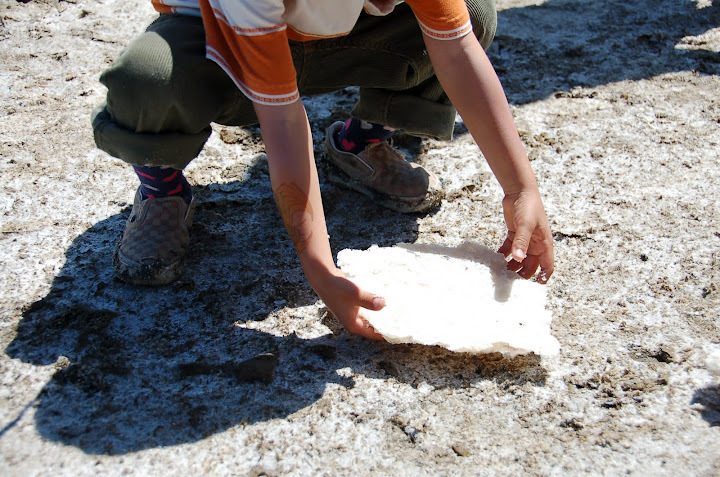 My kids love returning to the salt flats to explore and stomp and dream of licking all that salt (they're weird like that). I love the birds - those huge American White Pelicans are so fun to watch soar. I'm not much of a birder, per se, but these Pelicans are awesome. And they're great for young birders because they're hard to miss with the 9 foot wing span (9 feet?!). The colors of the place are gorgeous - the blues and yellows and greens just pop. The geography dork in me loves that Alameda Creek, which we splash in at Sunol Regional Wilderness, empties out into the Bay at Coyote Hills. There's an Ohlone village worth visiting and the boardwalks over the water are fun to explore. I predicted that our kids would like the Visitor Center but they ranked it 4th out of 4 Visitor Centers we've been to recently. I still think it's cool. Yeah, okay, there are some downsides. There's not much shade. Bikes whiz by on the sometimes narrow paved paths. And you'll find some bird poop. But we can overcome these things, right? There's a pattern to the Outside Kids madness. In the spring we head east into the warm but not yet hot parts of the Bay Area where the hills are green and not yet golden brown and the creeks have water flowing. In the summer we stay near the Bay where the cool breezes off of the water usually keep the air temperatures tolerable. So on July 15 - that's this Sunday - we'll head to 1-2 feet above sea level and explore Coyote Hills Regional Park. Join us! But first, there's some pre-reading for you grown-ups. Read this article - Look, Don't Touch - by David Sobel and published in the delicious Orion Magazine. I couldn't agree more. And that's why there's no program to these Outside Kids adventures. We just go. And what better place to "just go" than Coyote Hills. It's big and flat and wide and spacious. There are birds and feathers and ground squirrels and lizards. 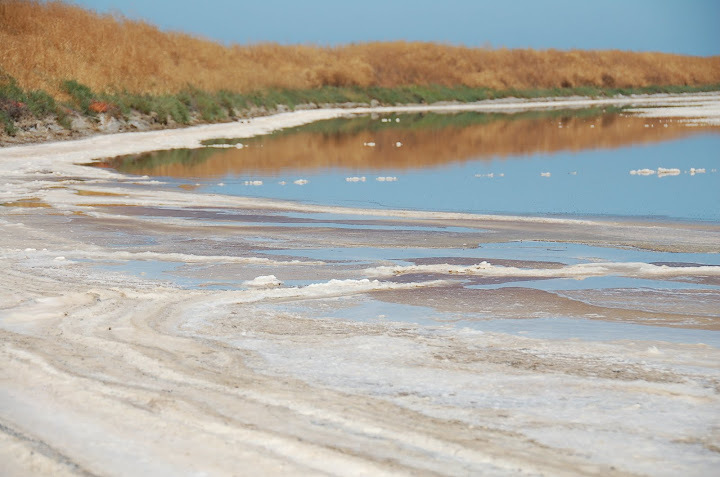 There are cool salt ponds to explore which kinda feel like the moon or some other planet. There's a marsh with raised boardwalks to walk on. There's a shellmound left by the people who lived in this beautiful place hundreds of years ago. What there isn't a lot of is shade... so bring yourself a hat and put on some sunscreen. We'll lie in the shade of the oak trees near the very cool Visitor Center after our explorations. We'll meet in the parking lot in front of the Visitor Center at 10:30am on Sunday, July 15. Directions can be found here. How this all works can be found over here. Hooray! It's summer. It rained on us at the beach today, but it's summer. We're spending as much time outside as we can. How 'bout you? We went to Point Pinole on June 24 and it was way fun. We're going to Coyote Hills on July 15 and we'll find some kind of adventure. In the meantime, however, I'm going far away from this machine. This machine and I need a break from each other. Hope to see you outside at Coyote Hills on the 15th or somewhere else outside.